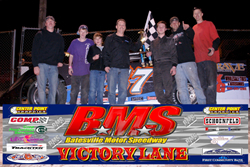 April 20th, 2013 - The team planned to enter a pair of COMP Cams Super Dirt Series (CCSDS) events over the weekend, but Friday night's $2,000-to-win, program at Batesville Motor Speedway (Locust Grove, Arkansas) fell victim to rain. As a result, the team entered a single event as they traveled to I-30 Speedway (Little Rock, Arkansas) on Saturday evening for a $2,500-to-win program. With twenty-six Super Late Models on hand for the event Chandler raced to a dominant win in his heat race to lock into the fifth starting spot for the 35 lap feature at the 1/4 mile oval. During the early stages of the feature Petty raced his way to as high as the fourth position before the handle began to go away on his entry, and he slipped to a ninth place finish. Full results from the event are available at www.COMPDirt.com. April 5th, 2013 - Chandler opened his 2013 season with a bang on Friday night by powering his #47 Chandler Petty Motorsports/Rocket Late Model to the feature win at Batesville Motor Speedway (Locust Grove, Arkansas) in the track's season opener. After enduring a tough 2012 season, which saw the young driver go winless on the year, Petty is off to a much better start in 2013. He opened his campaign with a NeSmith Weekly Late Model Series event at the 3/8 mile oval. Chandler started his night by powering from the fifth starting spot to a second place finish in his heat, which locked him into the third starting spot for the feature. As the race went green Petty jumped to the second spot and followed race leader, Robby Moore, for the first sixteen circuits before he used a slide job to take over the lead. Once out front he never look back on his way to the win, which came over Robby Moore, Gavin Landers, Roger Witt, and Joey Smith. "It feels awesome to not only start the year with a win, but to get back to victory lane period," an elated Petty commented. "I have to thank my crew and my sponsors as well at TJ Hughes, who's been lending a helping hand all week. Full results from the event are available at www.BatesvilleMotorSpeedway.net.